Like most people who have been there I love "safari" Africa � the southerly part of the continent so eloquently described by famous author/hunter Robert Ruark who managed to capture the extraordinary beauty and excitement of its landscapes and wild critters. I could write reams about this mecca for outdoorsmen and my three trips there, but before I wander, I know I left many of you hanging in my last column with news of a new African black bass record in Zimbabwe. Here's why it was personally so exciting to me. The monster female bass was a descendant of the original Florida-strain bass I shipped to Zimbabwe in 1982. I couldn't have been more proud than a man presented with his first grandchild. What role did Ray Scott play in seeding the African continent with bass? So here's the official skinny. 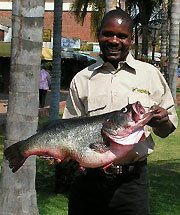 A certified largemouth bass weighing in at 18 pounds, 4 ounces was caught on July 25, 2004 by Maxwell Mashandure, a 30-year-old native Zimbabwe fisherman. This was recorded by Clive Harris at the Master Angler Tackle Shop in the capitol city of Harare, where the big bass was weighed and measured almost 2 days after being caught. Optimistically, Harris believes the 27-inch long and 25-inch girth largemouth would have been close to the 20-pound mark had it been weighed immediately after being caught. The monster was caught by sporting tackle and Mr. Mashandure was armed with a 6'6" Shimano rod and Shimano Chronarch reel. Fishing from a one-man canoe he reportedly caught the new African record bass on a junebug-color Zoom Fluke. So add the name of Darwendale Lake � a 15-mile long, vegetation-cluttered reservoir in Southern Africa � to other trophy bass hotspots like Florida's Lake Toho, Lake Castaic in California and the Texas brag board Lake Fork. Darwendale Lake has a reputation for yielding double-digit-size lunkers. According to tackle-shop operator Clive Harris, 10-pound-plus bass are caught there almost weekly. The lake has a good population of baitfish � primarily tilapia � and lots of vegetation in the form of a hydrilla-like weed locals call "oxygen weed." The water temperature seldom dips below 60 degrees so the bass and baitfish have an ideal growth environment. The severe drought of the mid-'90s has subsided, but it actually benefited the lake since many largemouth bass were moved from other low-water, shrinking impoundments and put into Lake Darwendale. As the writings of Robert Ruark whetted my early-day dreams of faraway African adventure, it was the formation of the Bassmasters of Rhodesia in Bulawayo in 1971 that eventually led me to Zimbabwe. BASS member Alex Henderson was the founding president of the Bulawayo club, the first affiliated BASS Chapter outside the U.S. borders. From those seeds, the interest in bass fishing spread over the country. By 1979 the clubs were united as a BASS Federation with Gerry Leach as president. The next big step was to send a seven-man team to the National BASS Federation Championship in 1980 at Oklahoma's Grand Lake. Meeting the African anglers and hearing their stories of true thrills in the bush, their efforts to spread the interest in BASS membership and the black bass itself brought me and my son Steve Scott to Zimbabwe the next year. To my surprise and delight we discovered black-bass fishing deep inside Africa. Northern-strain black bass were introduced into Rhodesia in the early 1940s. The bass had been brought to South Africa in 1927 and raised at the Jonkershoek Hatchery near the Cape. During the formation and growth of the BASS Federation in the late 1970s, Gerry Leach and Bassmasters Milton Jones, Rex Sheasby and Frank Hendricks made contact and became friends with the staff at the Matopos research station. Like Johnny Appleseed dropping his seeds, their efforts bore fruit. About 25 kilometers from Bulawayo, below the famous Matopos Dam, the government operated a hatchery. With Piet Le Roux's assistance at the Matopos Research station, the hatchery successfully started to breed black bass for stocking and distribution. During the 1981 "Scott Safari" we had a guided tour of the Matopos Hatchery. After seeing the facility and hearing the accounts of successfully stocking the northern-strain bass, my bassin' brain made a whirl. What could be the future of trophy-bass fishing if the Florida-strain black bass could be introduced to Zimbabwe? Back in the USA I contacted some friends at Delta Airlines and made some great new friends at South African Airways. After conferring with some good buddies in the bass-stocking business we arranged for 2,500 Florida-strain bass fingerlings to be lovingly airlifted to Zimbabwe by way of Johannesburg, South Africa. Five days later they arrived with only seven fingerlings DOA. The survivors were reared at the hatchery and started making babies. The offspring from the initial hatch were then stocked into lakes and streams. So the story of Maxwell Mashandure's near 20-pounder is an angling achievement in which we all share. The 18-pound, 4-ounce largemouth is a descendent of the original Florida-strain bass I airmailed to Zimbabwe in 1982. As to a bigger largemouth � one over George Perry's 22-04 longstanding world record � why not? Before we wrap this up and tie a ribbon on it, let's go back to Robert Ruark who penned his famous "Use Enough Gun" in 1952. No doubt Mr. Ruark would have been amused that Maxwell Mashandure was loaded with 25-pound Trilene Big Game when he went into the thick grass after his heavyweight foe. As a working book title, maybe Ruark would have agreed to "Use Enough Line." If you have any comments, questions or column suggestions, drop Ray a line by clicking here. What's your opinion of this column? Tell BassFan (and Ray) by clicking here.